Chamber of Electrical Engineers and the Antalya Chamber of Architects Antalya Branches had organized successfully the First Solar Semposium on 17 to 18 September 2010 in Antalya, with the aim of gaining the solar energy related technological innovations and applications and dispatching, intensification the knowledge in Turkey. 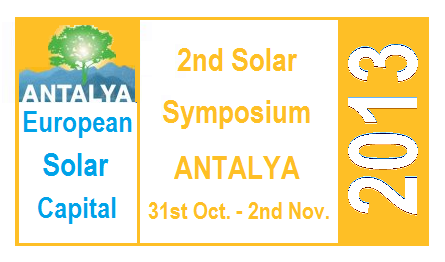 Antalya Branch and the Chamber of Electrical Engineers and the Chamber of Architects Antalya Branch, are organizing the 2nd Solar Semposium at 31st October to 2nd November 2013 in Antalya where at least 300 days of sunshine per year exceeds 1,312 kWh sunshine strength is falling per square meter per year. 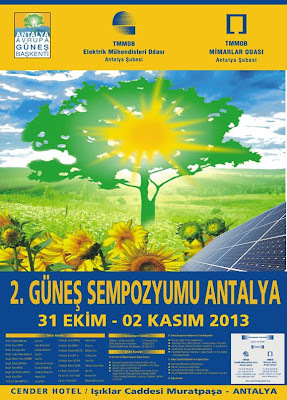 The aim of the symposium to gather the professionals from private and public sectors that are working in the implementation of these technologies, the law makers, public executives, researchers, academicians and industrialist around content rich forums, to help to spread the usage fields of solar energy, to inform our public about the domestic and foreign technologies usage and production in Turkey. 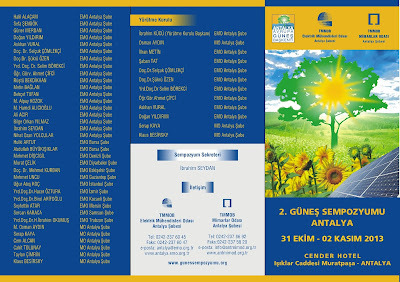 Branches of Chamber of Electrical Engineers and Chamber of Architects: In a period that the type and usage scheme of the energy needed by humanity is gaining importance; are emphasizing the importance of Solar Energy, that is clean, endless, compatible with the nature and environment, that is domestic, renewable energy source. 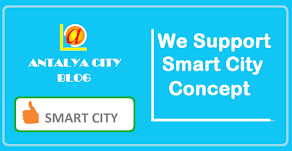 Adittionally the two institutions are emphasizing the importance of supporting ecologic architecture, engineering, planning, green buildings, energy efficient buildings. 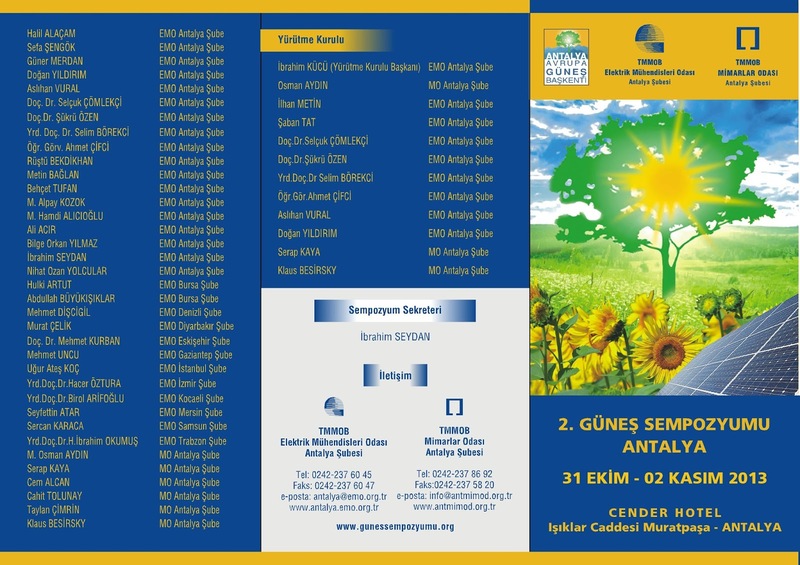 Panel meetings will be held on these issues and rich content papers will be presented. Antalya The European Solar Capital is inviting all the people, institutions and organizations, that are related or interested with the applications, projects, targets, development of domestic industry in SOLAR ENERGY that is one of the most important renewable energy sources, to join the 2nd SOLAR SEMPOSIUM in ANTALYA.